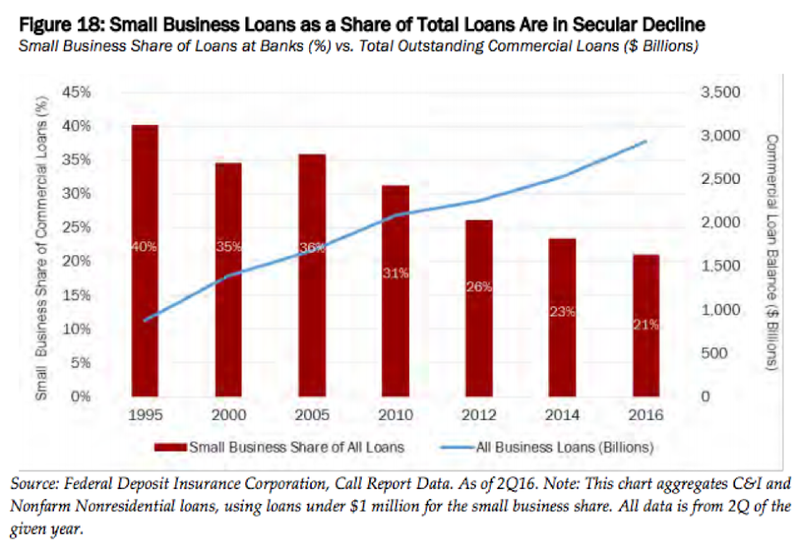 Home > Commercial Lending > Dodd Frank: How it’s repeal will effect small business lending. Dodd Frank: How it’s repeal will effect small business lending. The Consumer Protection Act and Dodd Frank Wall Street Reform is a massive piece of financial reform legislation passed by the Obama administration in 2010 as a response to the financial crisis of 2008. Named after U.S. Senator Barney Frank and U.S. Representative Christopher J. Dodd, the act’s many provisions, spelled out over approximately 2,300 pages, are being applied over a period of several years and are intended to decrease various risks in the United State’s financial system. The act created a number of government agencies tasked with overseeing numerous components of the act and by extension various aspects of the banking system. President Donald Trump promised to repeal the act, and on June 8th, the House of Representatives voted to replace it with the CHOICE Act, which will retract significant pieces of Dodd-Frank. The CHOICE act, however, is not expected to pass the Senate in its entirety. Consumer Financial Protection Bureau: The CFPB was created to prevent predatory behavior by banks, but has faced heavy criticism for the unilateral power of the Director of the Bureau. The Volcker Rule: The Volcker rule limits the risky investments banks can make, specifically banning banks from proprietary trading and investing in hedge funds or private equity funds. However, Republican from Massachusetts, Scott Brown successfully pushed to allow banks to invest less than 1% of their total value into these funds. The Consumer Financial Protection Bureau (CFPB) is supposed to prevent predatory mortgage lending (reflecting the widespread sentiment that the subprime mortgage market was the underlying cause of the 2008 catastrophe) and make it easier for consumers to understand the terms of a mortgage before finalizing any documents. It prevents mortgage brokers from earning higher commissions for closing loans with higher fees and/or higher rates, and says that mortgages originators cannot steer potential borrowers to the loan that will result in the highest payment for the originator. The CFPB also governs other types of consumer lending, including credit and debit cards, and addresses consumer complaints. It requires lenders to disclose information in a form that is easy for consumers to read and understand; an example is the simplified terms you’ll find on credit card applications. A key component of Dodd Frank, the Volcker Rule (Title VI of the Act), which restricts the ways banks can invest, eliminating proprietary trading and limit speculative trading. Effectively separating the investment and commercial roles of a bank, the Volcker Rule curtails an institution’s ability to employ risk-on trading techniques and strategies when also servicing clients as a depository. Banks are restricted from working with private equity firms or hedge funds, as these kinds of businesses are considered to be too risky. In an effort to decrease conflict of interests, financial firms are not allowed to trade proprietarily without sufficient skin in the game (collateral from the borrower). The Volcker Rule is a mirror of the Glass-Steagall Act of 1933 – a law that first recognized the inherent dangers of financial entities extending commercial and investment banking services at the same time. The act also contains a provision for regulating derivatives such as the credit default swaps that were widely blamed for contributing to the financial crises of 2008. Because these financial derivatives were traded over the counter, as opposed to centralized exchanges as stocks and commodities are, many agnencies did not realize the size of their market and the risk they posed to the greater economy. Dodd Frank set up centralized exchanges for swaps trading to reduce the possibility of counterparty default and also required greater disclosure of swaps trading information to the public to increase transparency in those markets. The Volcker Rule also set the financial firms’ use of derivatives in an attempt to prevent “too-big-to-fail” institutions from taking large risks that might wreak havoc on the broader economy. Dodd Frank also established the SEC Office of Credit Ratings, since credit rating agencies were accused of giving misleadingly favorable investment ratings that contributed to the recession. The office is tasked with ensuring that lenders improve their accuracy and provide meaningful and reliable credit ratings of the businesses, administrative district and other entities they evaluate. The FDIC reports that since 2005, the total amount of business loans has grown from $1.75 trillion to an all-time record of nearly $3 trillion — while at the same time, small business loans have gone from 36% of this share to just 21%. Researchers at the Harvard Kennedy School have found that community banks’ share of U.S. banking assets and lending markets has dropped from over 40% in 1994, to roughly 20% in 2015. They found that community banks emerged from the financial crisis with a 6% lower market share, but since the passing of Dodd Frank, this decline has nearly doubled. The law’s increased regulatory requirements force banks to invest more capital to meet compliance requirements. Increased compliance expenses disproportionately hurt community banks, which do not have the capacity to manage the increased costs. Small banks, despite accounting for half of all small business loans (and being twice as likely to approve small business loans as big banks), account for just 22% of outstanding bank loans. Big bank lending and big corporate debt have grown to all-time highs, but small banks and businesses have been left behind in this unprecedented low-interest-rate environment. The repeal of key provisions of Dodd Frank could decrease the market’s fear of lending to SMBs, attracting more Wall Street capital to the space and decreasing the compliance costs to community banks, thereby freeing up more capital to lend to SMBs. Unfortunately, these changes may be coming later than is ideal, as interest rates are on the rise. Small banks can’t recover overnight and may be unable to keep up with the funding demand. We’ve seen an increased demand ourselves, and I suspect that online funding will continue to grow in this regulatory environment — in fact, it must to support the small businesses we need to fuel our economy.